Long term assets such as patents and trademarks and long term financial assets such as shares held in other companies. In this tutorial I focus on long term tangible assets. Many of the principles discussed here can be applied to Long term assets. Almost any company utilizes long-term assets. Examples of such assets are trucks for transportation companies or computers, tables and chairs for software development companies. What does “long term” mean? As a rule, “long term” refers to more than a year. So, long-term assets are those whose economic life (the period of their being used by a company) is longer than a year. Long-term operational assets are defined as resources with economic lives of more than a year that a business possesses and uses in generating revenue. The cost of long-term assets is recognized as an expense in the accounting periods in which they are used. So, if a table is expected to have an economic life of three years, then the table cost will be allocated over this three-year period. Long-term assets can be tangible and intangible. Tangible assets are those which one can touch and include natural recourses, machinery, tools, equipment, buildings and land, among others. Intangible assets may be represented by a piece of paper or document. The real value of such assets is the rights and privileges extended to their owners. Examples of intangible assets can be patents, trademarks and customer lists. Tangible assets are divided into three categories: property, plant and equipment; natural resources; and land. Property, plant, and equipment include furniture, cash registers, computers, and others. In order to keep track of all assets in this category an entity can assign subcategories for a particular item or items of similar nature. The process of expense recognition for property, plan, and equipment is called depreciation. Depreciation is allocation of the cost of property, plant, and equipment to expenses over their useful (economic) life in a systematic and rational manner. Natural recourses consist in (but not limited to) gas reserves, reserves of timber, mines, and so on. These assets are sometimes called wasting recourses because their value diminishes as the recourses are removed and used. The process of expense recognition for natural recourses is called depletion. Depletion is allocation of the cost of natural resources to expenses in a systematic and rational manner over the resources useful life. Land is classified as a separate category for one major reason – land is not a subject to depreciation or depletion. Land is considered to have an infinite life, which makes it impossible to estimate its depreciation or depletion. Intangible assets also fall into a few categories: specifically identifiable intangible assets, and goodwill and intangible assets with indefinite lives. Specifically identifiable intangible assets can be acquired individually. They include patents, copyrights, etc. The process of expense recognition for this category of assets is called amortization. Amortization is allocation of the cost of intangible assets to expense in a systematic and rational manner over the useful life of the asset. Goodwill and identifiable intangible assets with indefinite lives represent the second group of intangible assets. A company can record goodwill only by purchasing another company with good reputation, established clientele, or other features that provide an above-average profit potential. Identifiable intangible assets with indefinite lives do not have definite useful lives or such lives are not practicable to determine. Examples of such intangibles may be renewable broadcast licenses or trademarks (in certain circumstances). Neither goodwill nor intangibles with indefinite lives are subject to amortization. However, those assets are subject to the impairment test as defined by generally accepted accounting standards. We will not cover impairment in this tutorial as it extends beyond the principles level. All assets are recorded at their historical cost. A historical cost includes the purchase price and any additional costs necessary to obtain the asset and prepare it for the intended use. Additional costs (costs besides the purchase price) may include transportation costs, insurance for asset delivery and others. Purchase of a building: purchase price, title search and transfer documents, real estate fees, and remodeling costs. Purchase of equipment: purchase price, delivery costs, installation, and costs for modifications to prepare the asset for intended use. Purchase of land: purchase price, removal of old buildings, title search and transfer documents, and real estate fees. There are a number of expenditures that cannot be included into the cost of an asset. Such expenditures include payments for fines, damages, and so on, which are not considered normal costs of acquiring an asset. Sometimes a company buys several assets for a lump sum. The total of market values of individual assets included in the purchase may be greater than the total price paid by the company. Such a purchase is called a basket purchase. The company must determine how much of the total price should be assigned to each asset. This can be done by using the relative fair market method. Look at the example below. When an asset is acquired, its cost is not expensed at the acquisition time because the asset is used for more than a year. Instead, the asset cost is allocated over its useful life. In another lesson we have seen how the straight-line method is applied. This method is appropriate when an asset is used evenly over its useful life. However, some assets can be used more extensively during their first years of operation. Other assets are used more during one year, but less during another year, and so on. This kind of assets requires accelerated depreciation methods, which charge more of the assets costs in the years of their more extensive use. To demonstrate application of different depreciation methods, let us look at the following example. A computer science graduate student decided to start his own business. The student, Mr. Serfy, will develop software for small businesses. In order to create reliable products, Mr. Serfy acquired a computer that cost $23,000 in 20X7. The computer is expected to have a salvage value of $3,000 and a 4-year useful life. Mr. Serfy has made predictions that the revenue stream will be $9,000 per year. 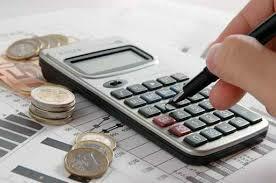 Provided that the revenue will remain the same each year, it is reasonable to employ straight-line depreciation method. Straight-line depreciation is a depreciation method in which periodic depreciation is the same for each period of the asset useful life. Cash + Comp. – A. Dep. = Cont. Cap. + Ret. Earn. The total cash inflow from the computer amounted to $40,000 ([$9,000 revenue x 4 years] + 4,000 salvage value). At the same time the acquisition cost was only $23,000. So, the computer not only recovered the investment, but also helped generate $17,000 ($40,000 – $23,000) of return on investment. Below you will find the financial statements and journal entries for the four years in which the computer was used and the straight-line depreciation method was employed. * These entries are repeated annually from 20X7 to 20X0. It is well known that any computer value declines with time. A computer may be considered “obsolete” in one or two years after acquisition. So, it is appropriate to assume that a computer will be used more extensively during the first few years of operation. In such situations, to calculate depreciation expense, a double-declining depreciation method may be more appropriate to apply. Double-declining method is used to record higher depreciation expense in the earlier stages of an asset’s life and respectively lower depreciation expense as the asset ages. This method is sometimes called accelerated depreciation method. Double-declining method applies a constant rate (double of the straight-line rate) to the net book value of the asset and produces a decreasing annual depreciation expense over the asset useful life. The decrease in depreciation relates to the decrease in the asset’s net book value in each subsequent period. Calculate the straight-line rate. It is calculated by dividing 100% by the number of years the asset is expected to be in use. So, in Mr. Serfy’s example, the rate is 25% (100% / 4 years). Determine the double-declining balance rate by multiplying the straight-line rate by two: 25% x 2 = 50%. Apply the double-declining balance rate to the book (carrying) value of the asset at the beginning of each period. Note that the book value of an asset cannot be depreciated below its salvage value. The computer historical cost is $23,000 and the salvage value is $3,000, so the amount to be depreciated is $20,000. Because $17,250 ( $11,500 + $5,750) is depreciated after two periods 20X7 and 20X8, only $2,750 more ($20,000 – $17,250) can be depreciated. Accordingly, the $2,875 is ignored in the third year because it exceeds $2,750 limit. Basing on the aforementioned considerations, the $1,500 is also ignored in the fourth year. Observe that the depreciation expense amounts diminished as the computer aged. Let us assume in this example that the revenue also changes during the 4-year useful life and amounts to $15,500 in 20X7, $9,750 in 20X8, $6,750 in 20X9, and $4,000 in 20X0. Financial statements for those periods are presented below. This method was designed to better match expenses with revenues when expenses change greatly from one year to another. Units-of-production method determines the useful life of an asset based on the units of production. Each period, the units of production determine the depreciation expense. This method is similar to the double-declining method because it also assumes that an asset is used more extensively during the first years of operation. Under this method, an important consideration is given to the number of years in the asset’s useful life. Sum-of-the-years-digits method applies a decreasing rate to the asset depreciable value and produces a decreasing depreciation expense over the useful life of the asset. The decreasing rate equals the fraction of a current year’s digit to the total of all year digits in the asset useful life. Sum up the year digits, beginning with the number of years the asset will be in use and going down to 1. For example, if an asset will be used for 5 years, the resulting total will be 15 = 5 + 4 + 3 + 2 + 1. Determine the depreciation for each year by multiplying the depreciable cost (historical cost – salvage value) by the fraction of each year digit to the total of all year digits (from step one). For instance, the depreciation expense for the first year will be Depreciable Cost x 5 / 15, for the second the expense will be Depreciable Cost x 4 / 15, and so on till Depreciable Cost x 1 / 15 in the last year. The entire depreciable cost is depreciated over the four years without a remainder or surplus. This is achieved because the factor for each year (i.e., 4, 3, 2, and 1) represents a part of a whole (i.e., 10). The four digits together equal the total (i.e., 4 + 3 + 2 + 1 = 10), and respectively, the entire depreciable cost is allocated to expense. Sometimes there are revisions of salvage value, useful life, or asset total projected output. In such situations nothing should be done to correct the previously reported financial statements. However, the new information is taken into calculations of the present and future depreciation expenses. Let us look at an example. A company bought a tool that cost $12,000 and has a salvage value of $3,000. The useful life is expected to be 3 years. Therefore, depreciation expense for the first year under straight-line method is $3,000 ([$12,000 – $3,000] / 3 years). Natural resources are recorded on the books at their acquisition cost. The process of expense recognition for using natural resources is called depletion. Recall that depletion is allocation of a natural resource cost to expense in a rational and systematic manner over the resource useful life. The units-of-production is the most common method to allocate the cost of natural resources. Suppose in 20X7 a mining company purchased a new mine for $6,700, plus real estate fees of $300 (totaling $7,000). No salvage value is expected. The mine is estimated to have approximately 14,000 tons of coal. So, the cost per ton is $0.5 (7,000 tons / $14,000). If the company extracts 4,000 tons in the first year, the depletion cost will be $2,000 (4,000 x $0.5). The depletion of a natural resource has the same effects on the accounting equation as depreciation of fixed assets has. Assets (Coal Mine) and equity (by increasing Depletion Expense) decrease. Cash + Coal Mine = Con. Cap. + Ret. Earn. To show the decrease in assets, a contra asset account titled Allowance for Depletion could have been used instead of directly affecting the Coal Mine account. In such a case, Allowance for Depletion has the same relationship with natural recourses as Accumulated Depreciation has with property, plant, and equipment. Both decrease the historical cost of assets to their book value. Intangible assets provide their owners with intellectual property rights, privileges, etc. When acquiring such assets, their cost is capitalized in asset accounts at historical cost. Depending on the asset classification, the cost may be expensed over the asset useful life. The expense recognition process for intangible assets is called amortization. Goodwill and specifically identifiable assets with indefinite useful lives. Maximum amortization period fixed by the law of a particular country. Cash + Patent = Con. Cap. + Ret. Earn. Note that the Patent account was affected directly by the expense recognition; however, a contra asset account Allowance for Amortization could have been used. Goodwill is the added value of a business because of favorable factors such as good reputation, location, etc. Specifically identifiable indefinite life assets are those for which a company cannot determine the useful life or such assets do not have a definite useful life. Both goodwill and indefinite life intangibles are not amortized because there is no enough information to make required calculations. However, such assets are subject to impairment testing. We do not review accounting for goodwill and indefinite life intangibles here because they are usually explained in accounting courses above the principles level. It is important to note that depreciation for property, plant, and equipment; depletion for natural recourses; and amortization for intangible assets are simply different terms used to refer to the process of expense allocation of different types of long-term assets.